Manchester City manager Pep Guardiola says the next week will be key as his side chase the quadruple. City will try to overturn a 1-0 deficit when they host Tottenham in the second leg of their Champions League quarter-final on Wednesday. They then host Spurs in the Premier League on Saturday before a top-flight trip to Manchester United on 24 April. "If we don't win these games, we will be out in two competitions. They are finals for us," said Guardiola. "I had that feeling from weeks ago as well, not just for this week." City have won the Carabao Cup and are in the final of the FA Cup, in which they will face Watford on 18 May, as they also continue to challenge for the Champions League. In the Premier League, they are two points behind Liverpool with a game in hand and can retain the title if they win their remaining five fixtures. They are aiming to become the first English club to win all four trophies in one campaign. 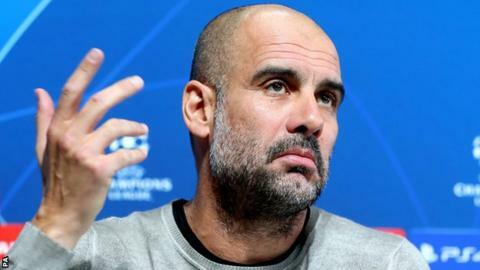 Guardiola added: "All the games are tough. We don't have rest. We play nine, 10 or 11 games more than Liverpool and I love this challenge." The manager challenged City's fans to create an atmosphere on Wednesday similar to the one when they beat Liverpool 2-1 in the league in January. "I'm really curious how are fans are going to react," he said. "[An atmosphere like] the Liverpool game will be enough for me - a little bit better. I want to see if they [the fans] want to get to the semi-finals." City centre-back John Stones said the side had "everything to play for" in their attempts to achieve the quadruple. "I don't think a lot of things are impossible; that is the mindset of different people," he said. "If you don't dream big, then you are not going to get anywhere near it. It comes from within everyone. We have this belief and ambition to do it."